Investment Weighted Returns are used to measure the performance of the fund. Money Weighted Return (MWR) takes account of deposits and withdrawals during the period being measured. It is also sometimes referred to as the Internal Rate of Return (IRR) of the fund. It can also be used as a method of comparing one portfolio’s performance against another. However, the MWR is only valid if both portfolios received/withdraw cash at the same time, because the timing and the size of the flows will affect the rate of return. 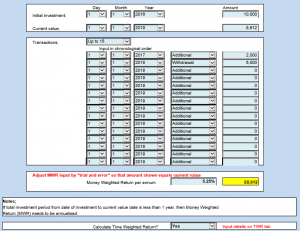 The Investment Weighted Returns calculator does NOT automatically calculate the Money Weighted Rate of Return. It is calculated on a ‘trial and error’ basis which means that a rate of return needs to keep being input until the calculated final value is near the current final value to determine the MWR. You can also calculate the Time Weighted Return (TWR) on a separate page. The TWR is unaffected by the timing of cashflows into (or out of) the fund. It is calculated by measuring the change in the value of the fund before the cash injection/withdrawal – therefore the value of investment before cash injection/withdrawal needs to be input, and multiplying this by the change in value after the injection/withdrawal. This means the TWR gives EQUAL WEIGHTING to the timing of cashflows. 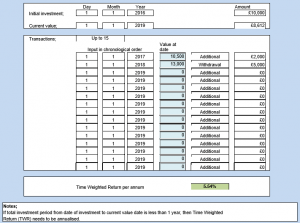 A client invests £10,000 at the start of year 1. Value of investment at end of year 3 is £8,612. Need to adjust the MWR until the calculated value shows £8,612 the same as the current fund value. In this case the MWR is 5.25%.